It’s time for Jeff Sessions to go! Trump needs a pit bull AG. How else to drain the swamp but with a “junkyard dog” making sure the real perps don’t get away? Jeff Sessions is a nice guy … and a good guy … and a real patriot. exactly what’s needed, if this administration is not to be taken down. that will inevitably evolve into a series of long, intense battles. too fierce for an AG who is too nice a guy. Trump is a General…of the first order. He’s in the middle of a war. minded men” who have been in the trenches fighting Deep State. agents of Deep State who have surrounded the White House. commitment to the Trump agenda. 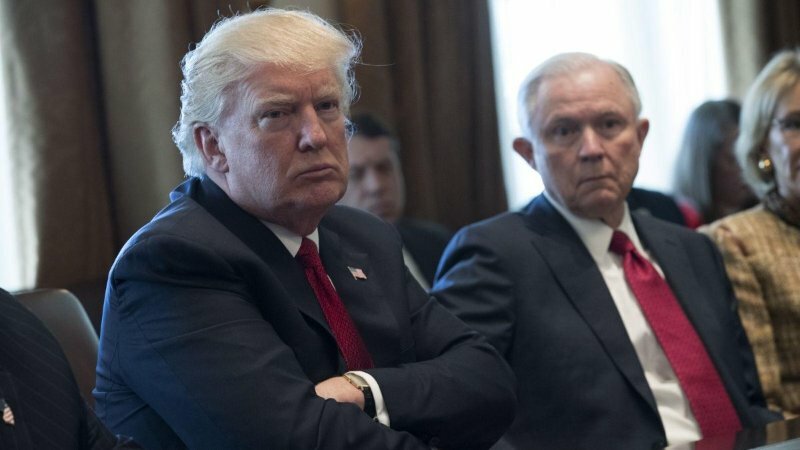 I certainly DO NOT want to give Washington Post (WAPO) any credit for the article (below) concerning intelligence leaks concerning AG Jeff Sessions, but when an article is collaborated by six WAPO writers, the assumption is…..yes, there is definitely a problem heading Trump’s way and he is going to be forced to ask for Jeff Sessions resignation in days to come. We now know that Sessions recused himself from the Russian “Witch Hunt” because he did in-fact meet with the Russian Ambassador and could not remember if he did or didn’t, but now says he “did not understand the question.” Leaked intel shows that Sessions discussed campaign information with the Russian Ambassador. We’ll probably learn the intel (conversation) detailed a working relationship with Russia….how terrible ! We all like Jeff Sessions, but as a former prosecutor…..Sessions appears to be too soft and naïve and his run for the Senate was probably his best move. As for President Trump and all his woes, he went into the White House with great expectations for the American people and picked his staff as if he was forming a club of friends to only discover the backlash and support leaves much to be desired. After 6 months, he is realizing the game in Washington is rigged and is working against himself and everyone around him. The establishment intends to isolate and destroy his presidency to no avail and will include his family and closest friends. The mental stress he is currently dealing with is going to force him to make some drastic decisions in coming days. The intelligence agencies are not working on behalf of the president, nor are they working on behalf of the people, but are in-fact the shadow deep state government that works independent of the White House and on behalf of the military industrial complex. The problem we are witnessing is the collusion between the CIA / NSA and the New World Order players on both sides of the Atlantic that (in the past) pick the puppet dictator or president of the United States with their NWO agenda in-mind. Most of these players are blackmailed useful idiots of the system and do what they are told, but in nice terms….provide their “analysis” and expect foreign policies to follow accordingly. President Trump was NOT supposed to be president, but Americans, fed-up with the establishment, came-out in droves and elected Trump in-order to re-shape America into a lawful government. Because Trump has not been blackmailed and has very little baggage…a stark difference from the 17 others he dismissed as “chokers and weak on policies,” he won the election fair and square over Hillary Clinton while the DNC attempted to steal 5 states and welcome illegal aliens to vote, a statement that Obama made on national television, which he said, “those that do go to the polls will not be harassed by I.C.E.” (something to that effect). Now that Robert Mueller has entered from the swamp, he is going to do what his handlers want him to do and that is to destroy this presidency by any means necessary, including the use of the “domino effect” by going after anyone and everyone over menial crap that doesn’t come close to the felonies hanging over Clinton and her cronies. The intelligence agencies were ordered to monitor and dig-up anything involving financial ties with Russia. This was supposedly ordered by Hillary and Obama. There is a trove of intel ready to go as Mueller proceeds and leaks will continue. I suspect, the big one will be both Trump’s tax returns and accusations by paid political hacks involved with the Miss Universe pageant in Moscow. Most likely nothing compared to the missing 33,000 Clinton emails, or Obama caught off microphone telling Putin that he will be more “flexible” after his re-election, or Hillary’s Clinton Foundation “pay for play” donations to approve the Uranium One deal to Russia while she was Secretary of State, the contrast is far from what Mueller will discover, but enough to begin the impeachment phase. Even though Nixon had to resign, following the “Saturday Night Massacre” when he fired many of his staff and went after the corrupt media, the result was not good, but what choices does President Trump have left, but to do the same. The entire world can change under Donald Trump by shutting down ISIS (as he is doing) to developing better trade deals without America giving-up her sovereignty, and closing the border to drugs and violence. The New World Order pundits and puppets, with a very strong intelligence agency, working in conjunction with MI-6, Mossad and the Saudi intelligence, etc….have worked their asses-off since WWII to completeHitler’s dream of a unified world government, but the only difference….the powers-at-be did not want Hitler to have it. Operation Paperclip brought to America (following WWII) thousands of Nazi’s and Hitler’s SS in America formed the CIA. By Trump playing nice with Putin, of whom has allied Russia with China, the plans for a New World Order, controlled by the illuminati, are at stake. In their minds, they believe Putin has a New World Order future plan that can undermine the current plans by those living in European mansions that own 75% of the world with the CIA on direct dial. No matter which New World Order plan succeeds, the enslavement of humanity is at risk. All we can hope for is for President Trump to delay WWIII by finding common ground with Putin, otherwise….WWIII will commence as soon as the Communists in America a.k.a. the shadow deep state government, destroy this presidency. President Trump has come to terms with the reality he faces and changes are being made. Jeff Sessions is weak and not productive and he has no plans to take-down Hillary Clinton, Obama, Podesta, Rice, Comey, Lynch and others. They are not in his sights because he knows that death seems to follow anyone that goes after / the plague Americans are trying to destroy and that is communism in America….therefore…it’s time for Sessions to resign. The communist coup is underway and Americans may have to react in a meaningful way if Trump is defeated. Russia’s ambassador to Washington told his superiors in Moscow that he discussed campaign-related matters, including policy issues important to Moscow, with Jeff Sessions during the 2016 presidential race, contrary to public assertions by the embattled attorney general, according to current and former U.S. officials. Ambassador Sergey Kislyak’s accounts of two conversations with Sessions — then a top foreign policy adviser to Republican candidate Donald Trump — were intercepted by U.S. spy agencies, which monitor the communications of senior Russian officials both in the United States and in Russia. Sessions initially failed to disclose his contacts with Kislyak and then said that the meetings were not about the Trump campaign. From The Desk of Capt. Dave Bertrand (Ret.) Int’l Airline Freight Captain on the DC-8 stretch jet / B-727 series 200 jet & First Officer DC-6 prop & DC-10 wide-body jet), 72′ to 76′ U.S. Army Veteran (Military Police) ‘Comms Sergeant’ (Korea), Law Enforcement (State), DHS Trained Counter-Terrorism Instructor for HWW, Border Security Specialist, Political Analyst and Activist to help “Make America Great Again” while exposing the “Deep State” shadow government enemy. My mission is to slice through the propaganda, encourage everyone to write and share important news among our network of patriots, military, law enforcement and selected news media sources (we trust). We are the pulse of America and we will prevail.